A rather interesting article has just popped up at Suite101.com. It details ten good co-op games to be had on Xbox Live Arcade for $10 or less. One of the titles, Command & Conquer Red Alert 3 Commander's Challenge, does NOT feature co-op, as we verified last week. However, the rest of the list is accurate. It's particularly nice to see some indie games on the list. There's some great fun to be had on the cheap! This side-scrolling, old-school shooter with hand-drawn levels is The Behemoth's first big hit, and gamers who don't want to pony up the 1200 MS Points for Castle Crashers will find a great game in Alien Hominid HD for 800. Alien Hominid features both Local and Online Co-op throughout its entire 16 level campaign, along with 7 mini-games and 50 PDA levels (an additional adventure mode) to keep players entertained after taking on the main game. Featuring both Online and Local Co-op multiplayer, Assault Heroes 2 challenges gamers' old-school shooter skills with this top-down action game for 800 MS Points. While perhaps not as endearing or challenging as Alien Hominid, Assault Heroes 2 offers great, classic shooter gameplay with numerous weapons, powerups, and vehicles to pilot and drive. Another great shooter on Xbox Live Arcade, Ikaruga is a legendary top-down gunner with a brutal difficulty, forcing players to "switch polarity" to avoid gunfire. Ikaruga costs 800 MS Points. Featuring both local and online co-op gameplay for 2 players, gamers must gun their way through 5 absurdly challenging levels, and fight for online leaderboard high scores and killer replays. 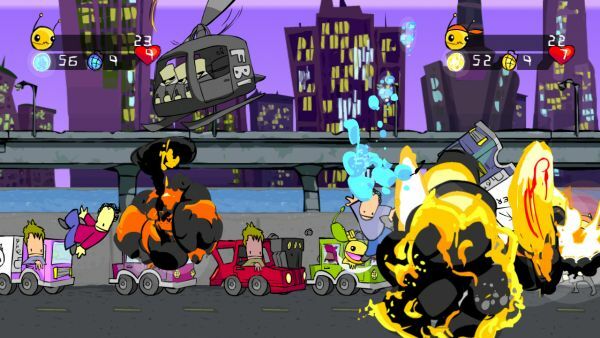 Players take control of Splosion Man in either single-player, or cooperative multiplayer either local or online, for 800 MS Points. Gamers looking for a 2-D platformer with a unique twist and co-op gameplay should give Spolsion Man a shot. A unique game designed entirely for cooperative play, one red ship and one blue ship must defeat enemies of the same color, while avoiding enemies of the opposite color. Schizoid costs 400 MS Points. Schizoid features online and local multiplayer, along with the option to go solo with a CPU controlled player, or go "Uber-Schizoid" and attempt to control both ships with one controller. Schizoid - A devilishly simplistic, though challenging, co-op experience. Old-school FPS at its finest, Doom and Doom II may look and feel ancient when compared to the likes of Halo 3 and Call of Duty World at War, but when it comes right down to it, Doom and Doom II both offer intense FPS for a fraction of the cost at 800 MS Points. With single-player, local split-screen and online co-op, there's plenty of fun to be had with these two old-fashioned, pixelated frag-fests. The classic is back on XBLA, with both online and local co-op gameplay for up to four players. Despite the gameplay, which can grown tiresome and dull, Gauntlet is still a great co-op experience, particularly for those who can look past the repetition and appreciate this old-school arcade coin-chomper for what it is. It's only 400 MS Points, so for nostalgic gamers with a few bored friends, Gauntlet is a great buy. A twin-stick shooter clearly inspired by Geometry Wars, Biology Battle pits 1-2 players inside a petri dish to fight off neverending waves of infections and parasites. Unfortunately, like most Xbox Live Indie Games, Biology Battle does not feature online co-op. However, it does feature a brand new, low-low price of 240 MS Points (three dollars). Fans of co-op shooters will find a lot to like about this intense Geometry Wars clone. Last but not least (except in the case of cost), I Maed a Gam3 W1th Zombies 1n It!! !1 delivers exactly what it promises. It's a game with zombies with 4-player local co-op. It's a Twin Stick Shooter. And, most important of all, it only costs one dollar, or 80 MS Points. Even though it doesn't last very long, the 4-player co-op will offer at least a few hours of zombie-killing amusement.